The Newport Art Museum will welcome two new exhibitions to its galleries this fall, Lalla Essaydi’s From “Converging Territories” to “Harem Revisited” and a group show entitled The Shapes of Birds: Contemporary Art of the Middle East and North Africa. An Opening Reception for both shows will be held on Friday, September 28, from 5 – 7 pm. 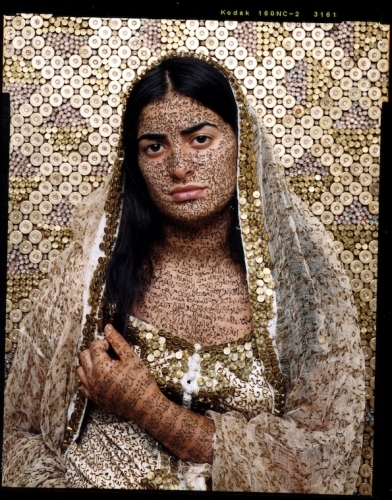 Lalla Essaydi is an internationally renowned artist who works in painting, installation, and photography. Born and raised in Morocco, she moved to the United States and earned her M.F.A. at the School of the Museum of Fine Arts / Tufts in 2003. As she explains, her artistic endeavors originated with the desire to examine her personal experience—to revisit her childhood in Morocco and consider the “converging territories” of her present life as a North African-born artist and woman living in America. This exhibition includes photographs spanning from the artist’s earliest series “Converging Territories” to the more recent series “Harem Revisited.” Bringing together photographs from different periods of the artist’s career, this exhibition illustrates Essaydi’s enduring engagement with culture, gender, and identity. For her photographic work, Essaydi constructs narratives, often within Islamic architectural spaces. By drawing on imagery reminiscent of Orientalist paintings, Essaydi underscores Western fantasies about the East, and Arab women in particular. At the same time she undermines these fantasies by clothing her female subjects and inscribing them with calligraphy, a sacred Islamic art form accessible only to men in the Arab world. Using henna for this calligraphy, Essaydi re-asserts the role of women in art and writing (henna is a form of art and adornment practiced by women). According to the artist, “By reclaiming the rich tradition of calligraphy and interweaving it with the traditionally female art of henna, I have been able to express, and yet, in another sense, dissolve the contradictions I have encountered in my culture: between hierarchy and fluidity, between public and private space, between the richness and the confining aspects of Islamic traditions.” Exploring these contradictions and disrupting stereotypes about women of the East, Essaydi’s work promotes a timely discussion of cultural perspectives and gender. Lalla Essaydi has widely exhibited her work nationally and internationally. Her recent shows include solo and group exhibitions at the: San Diego Museum of Fine Arts (CA), Carnegie Museum of Fine Arts (Pittsburgh, PA), Bahrain National Museum, Iris & Gerald Cantor Center for Visual Arts at Stanford University (CA), Museum of Modern Art, Baku (Azerbaijan), and Smithsonian African Museum of Art (Washington DC). She has work in many museum collections around the world including the Louvre (Paris, France), National Gallery of Art (Washington DC), Los Angeles County Museum of Art (CA), Arab Museum of Modern Art (Qatar), The Art Institute of Chicago (IL), Museum of Fine Arts, Boston (MA), Museum of Fine Arts, Houston (TX), Museum of Contemporary Photography (Chicago, IL), RISD Museum (Providence), George Eastman House (Rochester, NY), and Harvard University Art Museums among others.